Waist length pieptar with side opening (înfundat), decorated with black embroidery and black velvet edging on pockets, base and neck. Similar jackets often have the date they were made embroidered on the pockets. Waist length pieptar, decorated with black embroidery, and edged on black leather. 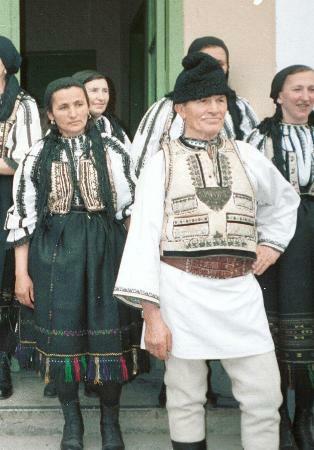 Photo taken in the village of Chirpăr, Valea Hârtibaciului, Sibiu county, April 1988.